Amateur film shot by Captain Torquil MacLeod of the 71st Highland Light Infantry. INTEREST. 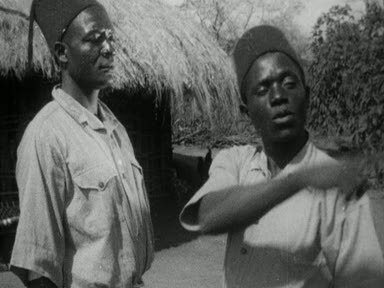 The film shows a practical experiment to establish a new African settlement in tsetse-fly country. Baghdad: - suk, forbidden Muharram festival procession and back street scenes. Kuwait:- 'id al Adha, bedu camp, Gerald de Gaurey - political resident coming ashore. Dam. Street scenes - Arab costumes possibly Sudan. Coronation Coach in Britain - Jubilee procession for George V. Dam again. Grandstand at racecourse? River journey through Burma. Giant Buddhas. Scenes in the life of a civil engineer and his family in Tanganyika, including bush safaris and camps. Home movie of HMS Capetown on the China Station, showing scenes at Hong Kong, Christmas 1936. Home movie of HMS Capetown on the China Station, featuring scenes at Hong Kong and Nanking, 1936. The production of cocoa beans in the Gold Coast and their shipment to England. Malay Regiment, August 1936. Presentation of Swords of Honour to Malay Officers in Kuala Lumpur.